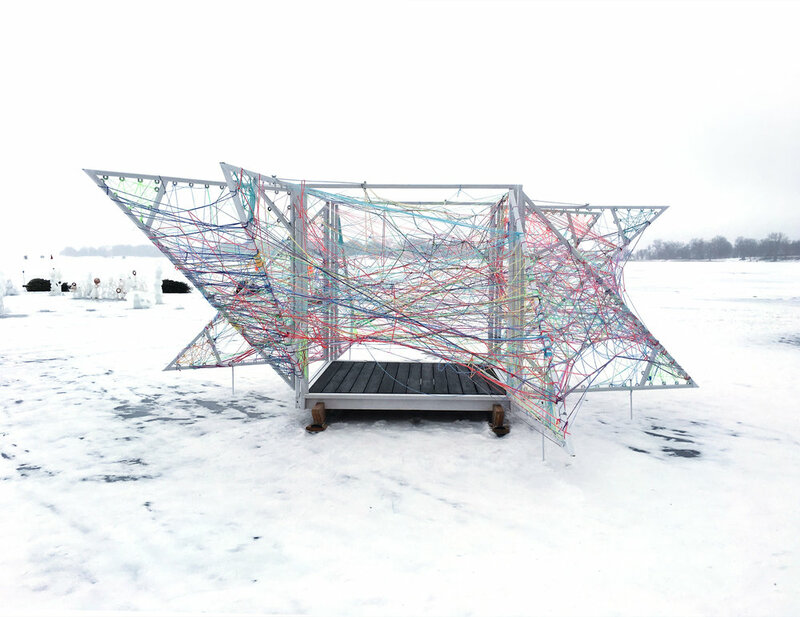 Using white-painted steel and colorful string, “String Box Shanty” encouraged hands-on interaction in a friendly, accessible way as part of the juried Art Shanty Project on frozen White Bear Lake. NewStudio's collaborative art installation reacted to the ever-changing lake environment and weather. It also showcased the effect of human touch. Visitors threaded string through steel washers welded to the 7 ft. x 7 ft. frame, creating unique patterns in a maze of overlapping colors. Hinged triangles, like flaps on an envelope, opened to add even more structural interest. NewStudio's team added reflective strips on the frame and glow-in-the-dark parachute cord in the lower triangles for a unique nighttime effect as well. View time-lapse and aerial videos of the String Box Shanty on Vimeo.